How can I reserve a trip? A 50% deposit will reserve a date for you. What is your cancellation policy? If the Anglers cancel a trip at least 14 days in advance a full refund will be made. If the trip is canceled in less than 14 days, the deposit will be applied to another date. The Captain can cancel a trip for weather reasons the night before a trip and your deposit will be applied to another date or refunded, your choice. Captain Bruce will not depart in rough seas. How can I avoid sea sickness? Purchase "Bonine chewable tablets" from any pharmacy. Take one the night before, take another one hour before the trip, and take a third after two hours on the water. What should I bring? Wear sneakers or boat shoes/boots with no black soles. Wear a Red Sox or Patriots cap, bring sunscreen, sunglasses, camera, an extra sweatshirt, sandwiches and drinks (NO BOTTLES). The captain supplies no food or drinks. Bring a cooler (leave it in your car) for fish fillets. The Captain supplies all bait and tackle. You’re welcome to bring a favorite fishing rod if you wish. What is your favorite type of fishing? 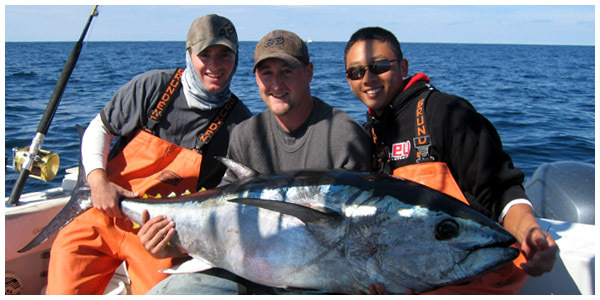 I target quite a few species but I have a special passion for offshore shark, mahi and tuna fishing. Jigging for codfish is a close second favorite along with fluke, tautog, stripers, sea bass, and bluefish. What's some of the best fish you've caught? The highlights of the last few seasons include a 310 lb thresher shark, 279 pound Mako Shark, 80 pound big eye tuna, several 22-28 pound codfish, countless school bluefin tuna to 115 pounds, and Longfin Albacore Tuna to 50 pounds. The largest striper I've caught is 46.5 pounds. I'm still waiting for that 50!